All of our nurse injectors have established, loyal clientele and are experts in what they do. While Dr. Nayak will continue to perform cosmetic injections at his regular, competitive rates for both new and established patients, his personally-trained nurse injectors will be able to offer the same quality of service with greater savings and easier appointment availability, including evening and Saturday hours. Avani is a former corporate attorney. 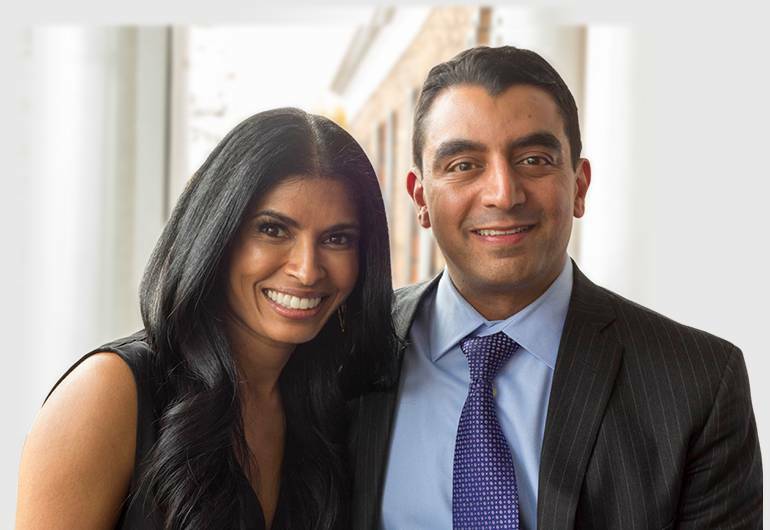 In 2006, Mike and Avani opened Nayak Plastic Surgery and opened Avani Derm Spa in 2010. They began with just three employees, and in the beginning few years Avani held a variety of roles ranging from receptionist to patient consultant to marketing coordinator. Today Avani strives to keep Nayak Plastic Surgery and Avani Derm Spa at their best, with the aim of providing superior services and excellent care to patients. Allie Israelson is the Office Manager for Nayak Plastic Surgery and both Avani Derm Spa locations in St. Louis. Allie began her career as an esthetician and quickly learned every position necessary to become a respected leader in a burgeoning business. She was instrumental in launching the Spa in 2010 and cultivated an expertise in all services and products provided by the spa and within the competitive landscape. Allie has been instrumental in the evolution of Nayak Plastic Surgery and Avani Derm Spa, from the early days of six employees to now leading nearly 40 highly skilled and helpful team members. Any questions or concerns will be addressed with the utmost respect and confidentiality. Erin is the Director of Marketing & Technology. She joined the practice as a consult coordinator in August of 2015 and later transitioned to her current role the following May. Her primary responsibilities involve overseeing technological operations, managing the practice’s social media accounts, creating and editing media as well as promoting providers, products and services. Erin’s primary motivation is to help improve the lives of those around her daily. Racquel Frisella, RN, BSN, AGPCNP-BC, is a board-certified Advanced Aesthetics Nurse Practitioner with over 9 years of experience in the industry. Racquel’s ever-evolving knowledge of the latest beauty innovations combined with her personable demeanor and eagerness to help others reach their beauty goals make her the go-to-girl for patients all over the country. Racquel has always had a passion for aesthetics and all things beauty. Her love for the art of aesthetic nursing is evident in her work. Racquel’s facial rejuvenation artistry is achieved with the use of dermal fillers, Botox, Dysport, lasers, and skin care. She has proven expertise in giving her patients the “natural look.” Having previously worked as a neonatal nurse, Racquel has a delicate injection technique. Racquel’s facial rejuvenation artistry is customized to each individual patient’s needs. She is dedicated to developing long-term relationships with her patients and she works very hard to ensure that each and every’s patients goals are understood and achieved. Elizabeth has over 12 years experience in the aesthetic industry and has been with Nayak Plastic Surgery since 2010. She thrives on developing a connection with her patients by discussing her patients desires and expectations. She previously worked in pediatrics and therefore has an extremely gentle touch when treating with injectables. Staying authentic to the individual’s true beauty is always her goal and focuses on accentuating their natural look. She listens closely to her patients to achieve this outcome. Elizabeth specializes in Dermal Fillers, Botox and Dysport, Coolsculpting, lasers and skin care. She has been building patient relationships for over 12 years and consistently continues to exceed their expectations. Kim has years of experience providing Botox Cosmetic and injectable filler treatments, and has almost twenty years’ experience assisting with surgery in Plastic, Cosmetic, and Dermatologic surgery procedures, including hair transplant. Jennifer has extensive experience in the aesthetic industry and joined the team with the opportunity to extend her professionalism. She has previous work experience with neonatal intensive care, dermatological skin care, and aesthetics. Jennifer is incredibly passionate about helping patients look and feel their best. Jennifer combines her thorough knowledge of facial anatomy, caring nature, and clinical training and expertise in cosmetic injections to achieve beautiful non-surgical results. Jennifer is highly trained in neurotoxins (Botox and Dysport), dermal fillers (Juvederm, Voluma, Restylane, Radiesse), IPL, laser hair removal, Ultherapy, and Coolsculpting. Jennifer formerly worked at a medical spa. She is enthusiastic and committed to providing patients with the latest techniques and trends in aesthetics and skin care. Shannon, is an experienced nurse practitioner and licensed injector with a passion for helping her patients in the aesthetics field. She was a previous nurse practitioner in a general dermatology office before joining our team. Her background helps her provide her patients with exceptional skin care needs. She is professionally trained in filler and botox injections, coolsculpting, cellfina, microneedling, ultherapy, and lasers. She is devoted to her practice and helping her patients reach their aesthetic goals. Julie has a true passion and excitement for the aesthetic field of medicine. She is an expert in injectable fillers, Botox/Dysport, Coolsculpting, Ultherapy, lasers, and microneedling. As an experienced operating room nurse, Julie has also had the privilege to assist Dr Nayak in surgery. This experience has given her a unique opportunity to be a true expert in facial anatomy, seeing the facial structures from the inside-out. Her thorough training, creative eye, and gentle touch make for beautiful results delivered with the utmost safety. Lucy graduated from Xenon International Academy in Ballwin, MO in 2010. As a teenager, she suffered from acne which led her into a career of Esthetics. Knowing first hand how hard problematic skin can be, Lucy conducts an in-depth consultation with her clients to help with their regimen at home. Lucy incorporates result oriented treatments into her facials along with relaxing massage techniques to pamper her clients. Lucy has trained with four of the top leading spray tan companies making custom spray tans her specialty. Lucy has a passion for treating problematic skin and helping to build self confidence in her clients. Chris has been doing esthetics for over the 10 years. She has experience with microdermabrasion, dermaplaning, various peels, skin care and makeup lines. She also supplements what she can offer her clients by including waxing, lash/brow tinting and spray tanning. Chris is a true believer in antioxidants and sunscreen…everyday – and REAPPLY! Spf’s and Retinols are a must for women over 30. Her warm personality and soothing touch captures everyone. Stephanie has always had a great passion for Makeup and Skin Care. She started doing makeup about 10 yrs ago which then grew into everything skin. She graduated from The Salon Professional Academy in 2012. Graduating with extensive knowledge in the Science of Skin, Microdermabrasion, Chemical Peels, Custom Spray Tans, Dermaplaning, Waxing, Lash and Brow tinting, and more! Stephanie absolutely loves educating and pampering her clients. She will provide an in depth consultation on what to expect and get you on the right track to results driven treatments. She will make sure you have the right skin care regimen that best fits your skins needs all while providing you with a heavenly facial experience. Her calling was to nurture and provide and through her work you can tell she truly loves what she does. Brittlyn graduated from the Skin Institute in St.Louis, MO. She formerly worked at a medical spa and comes to Nayak Plastic Surgery and Avani Derm Spa with experience in medical grade treatments and products. She loves helping people feel more confident in their skin. She is passionate in evaluating skin types and determining the best solutions for each individual. She enjoys learning and keeping up with the newest treatments and products in the industry. She is committed to making her clients not only love their skin but enjoy their time with her. Loving what she does makes her happy to come to work each day. Emily Altman specializes in non-ablative laser treatments such as IPL and laser hair reduction as well as various esthetic services. A graduate of Saint Louis University with a Bachelor’s in Communications, Emily received her aesthetics training in Chicago at Universal Spa Training Academy. She has extensive experience in both medical and cosmetic procedures and worked in both areas in a Chicago dermatology practice before joining Nayak Plastic Surgery. Brittanie has worked in the spa industry for over seven years, both in esthetics and in an administrative capacity. She has a deeply rooted passion for skin care that started when she was young and under the care of a dermatologist. She knows the feeling of avoiding mirrors or pictures and is also familiar with the never-ending cycle of trying new products. After getting her acne cleared, Brittanie understands her struggle as a gift and wants to spend the rest of her career giving back to her patients. In her esthetics career she focuses on both acne solutions, age rejuvenation and reversal technology. Each of Brittanie’s patients receives a detailed consultation followed by a treatment plan combined with an at-home-care regime, that helps to address their unique concerns and skin conditions. Thorough this approach, she hopes to provide all of her patients with a life time of healthy, youthful and beautiful skin. Brittanie is currently pursuing her masters in Biological-Chemistry before moving on to obtain an M.D specializing in Dermatology. She is thrilled to deliver this level of knowledge to her patients during every appointment. Lindsay’s passion for skincare started at a young age after dealing with her own skin conditions. After developing melasma in her early 20’s she made the choice to leave the corporate world for the treatment room to be able to help others. She loves developing comprehensive treatment plans for her patients to find and maintain healthy skin. Her number one products are antioxidants and SPF. Sam joined Nayak Plastic Surgery in November of 2012. She received her RMA in 2011 from St. Louis College of Heath Careers, and completed her internship through Washington University Dermatology. Sam was employed by Washington University Cardiology prior to joining Nayak Plastic Surgery and is currently pursuing a nursing education. Ischla is a bilingual medical assistant with over 10 years of operating room experience. She brings warmth and precision to every patient encounter. You can see her smiling face at our new Des Peres location! Megan joined the Nayak Plastic Surgery team in August of 2017. She is very knowledgeable about all of our procedures and treatments. She graduated with a Bachelors degree of Arts and Science in Sociology in 2011 and received her Clinical Medical Assistant certificate in October of 2016. Megan has been in the medical and spa industry for the past six years and can’t wait to demonstrate her experience to the fabulous patients at Nayak Plastic Surgery & Avani Derm Spa! Brook is knowledgeable about all of our treatments and procedures and can assist you with appointments, pricing, or other concerns. She is extremely capable and enthusiastic about quality patient care and strives to ensure that you have an excellent experience at our office. Brook received a BA in Communications from UMKC in 2002. She has been a member of the Nayak Plastic Surgery team since 2007. – Congratulations on 10 years Brook!! Shannon is knowledgeable about all of our treatments and procedures. She will be happy to assist you with appointments, pricing, or other concerns. Shannon has worked in the medical and spa field for 10 years and also has an associates degree in business. Emily is knowledgeable about all of the treatments and procedures provided at Nayak Plastic Surgery & Avani Derm Spa and would love to help you schedule your next appointment! She has been in the customer service industry for more than six years and always strives to make the patient experience a memorable one. Emily is currently working towards her degree in health sciences. Abbey is knowledgeable about all of our treatments and procedures, she has been in the Healthcare field for 13 years and has a background in Customer Service in the Medical Spa industry. She is also a Freelance Makeup Artist for Jane Iredale Cosmetics and would be happy to educate and assist you with all of your makeup needs! As one of Nayak’s newest members she couldn’t be more excited to be a part of our practice. She recieved her Associates Degree in Business in 2006, but has future plans to continue her education to become a Licensed Medical Esthetician. Caitlin joined the Nayak Plastic Surgery team in April of 2017. She is ecstatic to be a part of the team and is a long term fan of Dr. Nayak and his work. Caitlin comes from a background of veterinary medicine and dental assisting and has 12 years of customer service experience! Caitlin loves being the first point of contact to patients when they call or walk in the door and is dedicated to making their experience at Nayak Plastic Surgery and Avani Derm Spa the best possible! Sarah is thrilled to be the newest member of the reception team. In addition to having owned and operated her own spa, Sarah also has 15 years of experience in the customer service industry. This background has provided her with a thorough understanding of the importance of creating exceptional patient experiences. Sarah cannot wait to help schedule your next appointment and to answer any questions you may have!